Why different ? 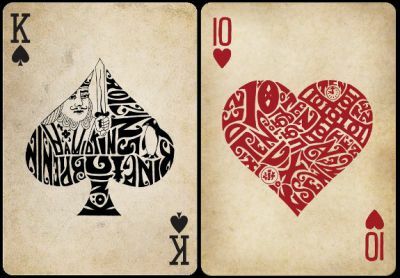 Because there is no Queen of hearts but there is a heart of Queens, and so on… Each card is a unique piece of art filled with symbolism and hidden elements. If you look closely at the king of spade you will see the word "king" written in several languages, a king chess piece and a king penguin. Let's see another card. A “dime” is hidden in the ten of heart. Brian Daniel South had been developing this deck for nearly 8 years, working with Nike Meyer, an artist from Florida. Price and where to find: The public price should be around US$ 12 and the publisher will try to make it easily available in the USA.